For crocheters looking for almost-instant gratification, this 4.5 hour afghan pattern will deliver in no time flat. Worked with chunky yarn in simple stitches, this is a very easy “big” crochet project that works up faster than most scarves! Get the free Presto Throw pattern below or purchase the ad-free PDF for $2.75 here. If you would have told me when I was a little 12-year-old mini crocheter roaming the aisles of craft stores that someday I would get to help announce new yarn lines, I would have thought my short little life was complete. 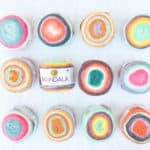 So today I feel honored to do just that–tell you about three new, fantastic Lion Brand yarns I got to try that you can now get your hands on too at LionBrand.com. The first yarn I’m thrilled to share with you is an extension of an old fave, Lion Brand Wool-Ease Thick & Quick. This is the chunky, versatile standby that I’ve used in the crochet Lineage Lapghan, the Cabin Boots with Flip Flop Soles, the Sierra Slipper mukluks and the knit Huggle hooded cowl. Wool-Ease Thick & Quick is also what in used in the Presto 4.5 Hour Afghan pattern I’m sharing below. The new Bonus Bundle options are not only twice as big as the usual 5-6 oz skeins, but there are some new exclusive colorways that you can only get at LionBrand.com. 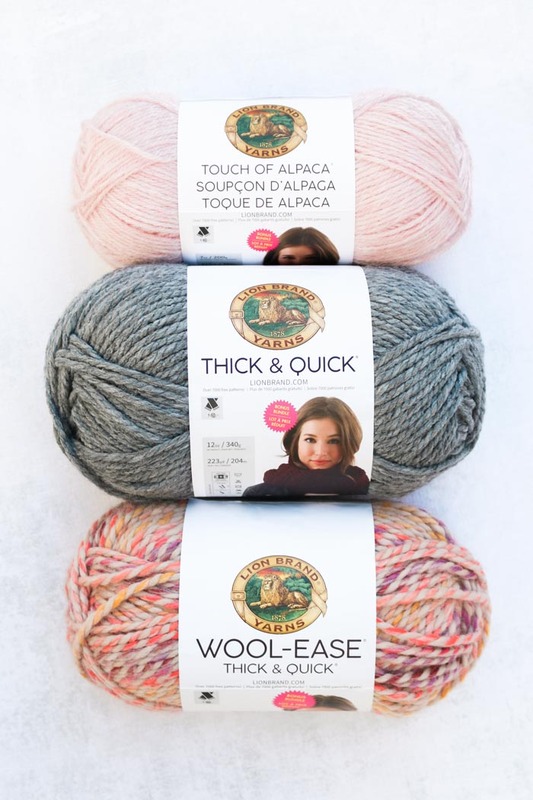 Secondly, the new Thick & Quick Bonus Bundle yarn is going to make all you non-wool-lovers veeeeerrrry happy! This super soft, chunky yarn is a 100% acrylic alternative to the fan favorite Wool-Ease Thick & Quick. I have to say, this yarn is so smooth and easy to work with and because it’s the same weight as its wooly cousin, you can swap it for any instances where a pattern calls for Wool-Ease Thick & Quick. I’ll be sharing free crochet patterns for Thick & Quick and Touch of Alpaca yarns in the next two weeks, but for now, you can go check out any of these yarns at LionBrand.com. Today, I can’t wait to tell you about how you can make an entire, squishy, textured throw in one day. Seriously, this 4.5 hour afghan only requires around 3-3.5 hours of hands on crochet time and then another hour of pom pom tassel assembly. 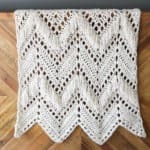 If you’re a beginner crocheter who wants to try a larger project, this very simple 4.5 hour afghan pattern is a great way to sink your teeth into something totally impressive, yet manageable. 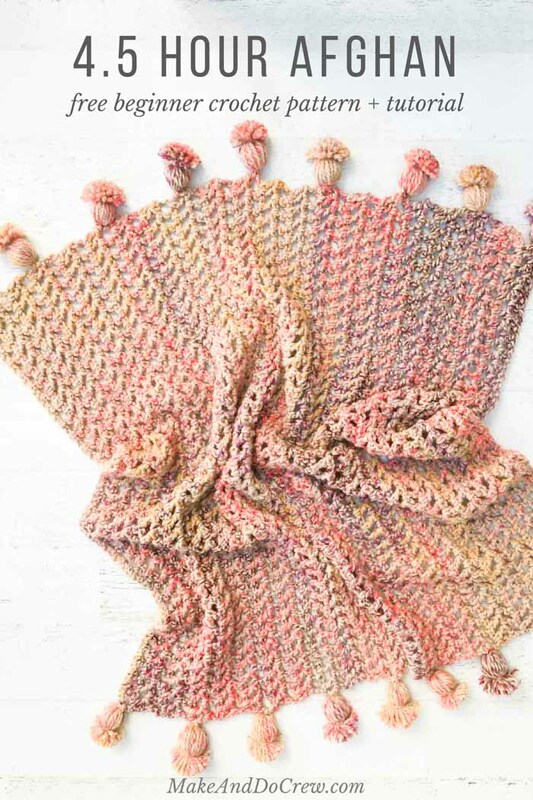 While this sample is made in the gorgeous and playful new colorway called “Spice Market,” I also think this super fast crochet blanket pattern would look beautiful and sophisticated in a cream or grey color. 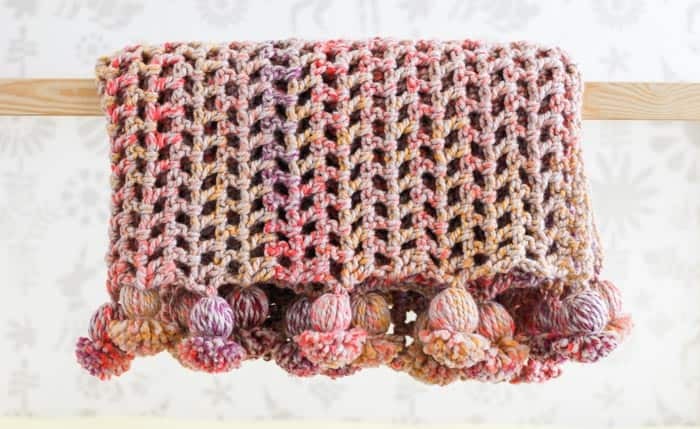 Adjusting the style or placement of pom pom tassels could also change the look of this pattern, so feel free to experiment with adding “flair” to the edge of your afghan. (You can find my basic pom pom tutorial here.) 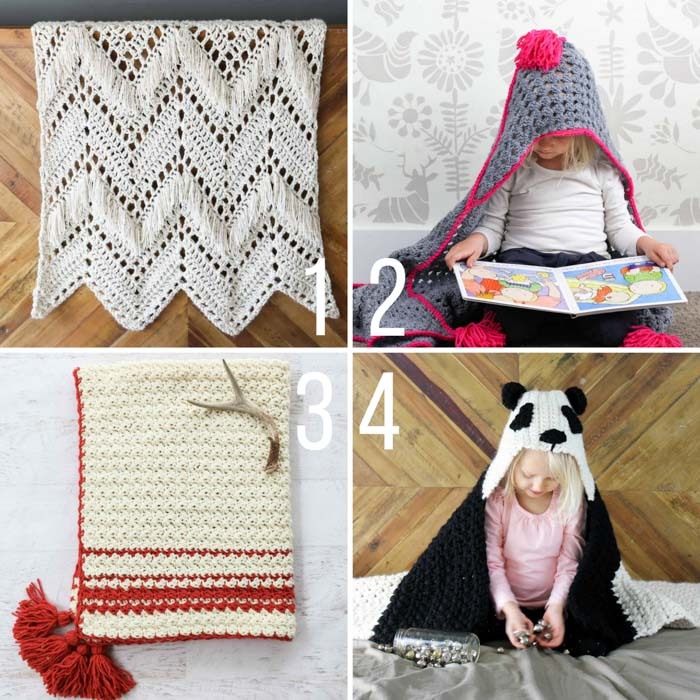 I can’t wait to see what you make with this super simple, fast blanket pattern! And when you’re ready, you can find all my free crochet afghan patterns here. Please do not publish or share this pattern as your own. You may make items to sell with this pattern. In exchange, please link back to MakeAndDoCrew.com and do not use my photos as your own sales photos. Now go make something awesome! 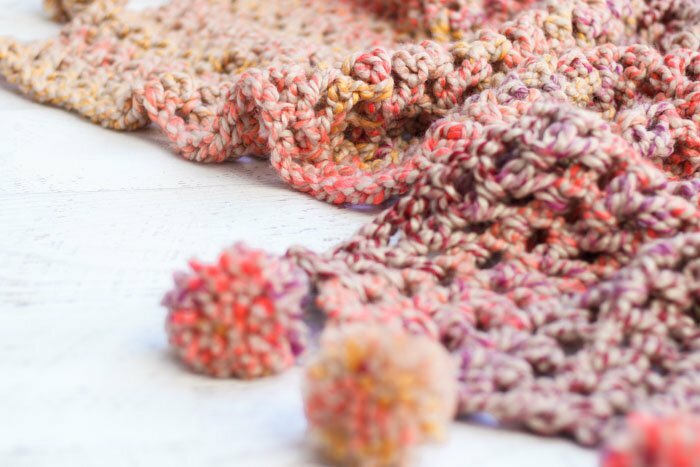 In less than five hours, you can whip up a chunky throw that’s equal parts whimsy and luxury. 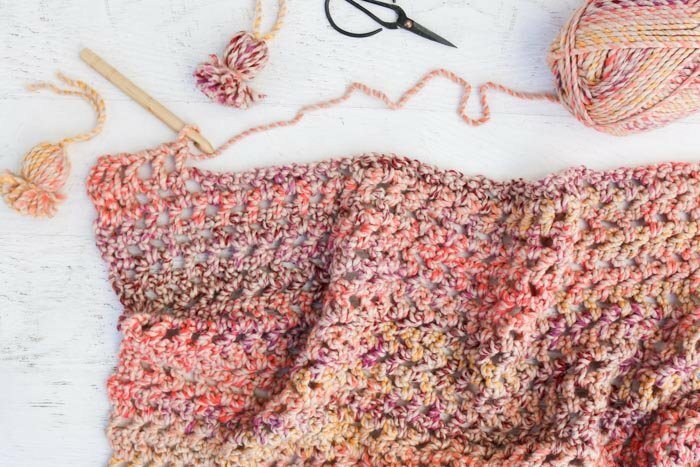 Using very basic chain and double crochet stitches, you’ll breeze through the body of the afghan in about three and a half hours and then add some pizazz with squishy tassels. This pattern is appropriate for confident beginners and anyone who likes to finish an entire afghan in a day! • Ch 4 at the beginning of a row counts as 1 dc and ch1sp. Work these chains slightly tightly to ensure ch1sp matches the ch1sps of the rest of the row. • Ch 3 at the beginning of a row counts as one dc. • To adjust afghan size, work any even number of chains. Foundation Row: Using larger hook, ch 82. Row 2: Ch 3, dc in first ch1sp, *ch 1, dc in next ch1sp; rep from * until end of row, dc in third ch of tch; turn. Row 3: Ch 4, dc in first ch1sp, *ch 1, dc in next ch1sp; rep from * until no ch1sps remain; ch 1, dc in third ch of tch; turn. Repeat Rows 2 and 3 to create 40 total rows. Fasten off and weave in ends. See below for a visual tutorial. 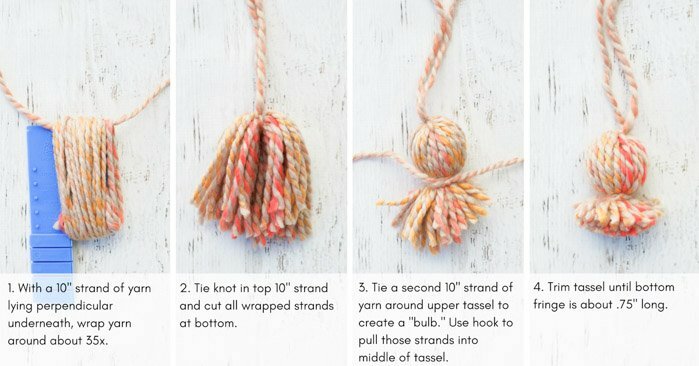 Make 18 tassels. Using MC yarn and a cardboard tube cut to 3.75” (or a tassel maker), wrap yarn approximately 33 times around the tube lengthwise. Insert 10” strand of yarn underneath wrapped yarn on one end of the tube. Tie a few secure knots, but do not trim these pieces. Use sharp scissors to cut the wrapped yarn at the other end of the tube. Along both shorter edges of the blanket, space tassels so that there is one in each corner and four rows between each additional tassel. To secure tassels, use the tails on the top of the tassel to tie a double knot in afghan space. Then pull tails to outside of afghan row (near the tassel) and tie another double knot. Insert smaller hook through the bottom of the tassel, pick up tails and pull them inside tassel to hide them. 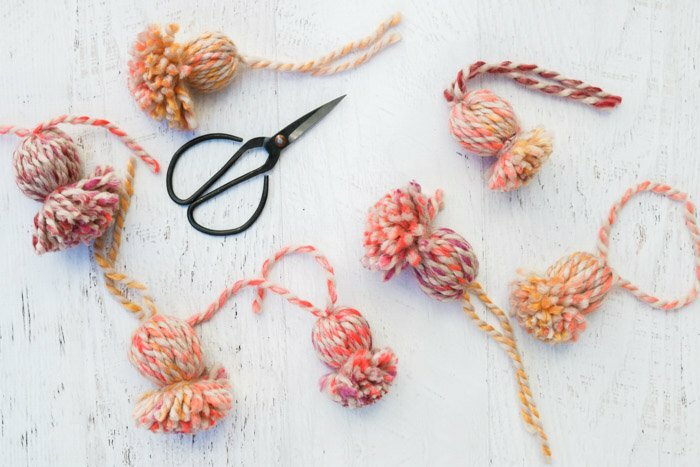 Trim each tassel to a similar length. Wrap up in your new Presto Throw and decide what you want to do with the second half of your day! Thank you for free instructions. You’re welcome, Penny! Happy crocheting! You’re so welcome! I really enjoy it. I am just beginning this pattern. I have one question. Is the larger hook used ONLY for the foundation chain stitch row? Do you then switch to the smaller hook? I do not see a reference to the smaller hook that was listed in the supplies list. Thanks! My blanket as I am making it is getting wider as i work up on rows. I am a bit confused about the chain 4 counts as a double crochet and chain 1 space and the ch 3 at begining count as a dc. I am chaining 3 and then doing an actual dc in 1st ch 1 space and then on next row I do same I am chaining 4 and then doing a dc in ch 1 space is that correct? I must be doing something wrong for the blanket gaining width as I work up. If def been there with the ever-expanding blanket before. My best guess of what is going wrong is that you’re working into the wrong spot on the rows that begin with a ch 4. 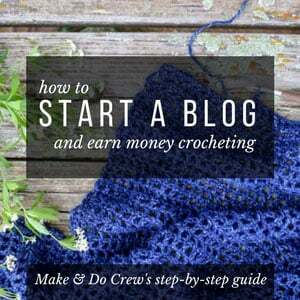 In those rows, you’ll want to skip both of the first two double crochets. Then you’ll work your first dc into that ch1sp that comes after the two dcs. In the rows that begin with 3 ch, there are no 2 dcs to skip, so the ch1sp comes immediatly. Just bought the PDF for the habtat cardigan. So pleased to have found you and look forward to making lots of your lovely patterns. Thank you very much for them. Thanks for your purchase and your kind words, Jenny! Congrats on working on new crochet skill! In the case of the ch 4, you’re creating the equivalent of one dc and one ch 1. But with the ch 3, you are just making the what is considering one dc in the pattern. It just depends on what’s going on with the row below and what you need to create in the new row. I think working it for a bit might help it all make sense. Let me know if not though! Hello, I was just wondering if you had any video tutorials for the 4 1/2 hr throw. Thank you for your time. I’m sorry, I don’t have a video for it at this time.